The Cocker Pug is a mix between the Cocker Spaniel and the Pug. The Cocker Spaniel is a medium-sized dog and the Pug is a small dog, and this results in a small to medium size dog. The Cocker Pug’s coat may be smooth or wavy and medium to long in length. His coat will require regular brushing. This dog is affectionate, friendly, and adaptable. He loves to spend time with his humans. They are intelligent dogs that are quick to learn and train, especially when praise and treats are used, although their Pug side may make them a little stubborn. They are good with children and make wonderful family pets. They can easily live in an apartment as long as they get daily exercise. Most are very smart but can be headstrong. Some may be very food-motivated. They pick up on the temperament of their owners and may be hyper or lethargic depending on their environment. Cocker Pugs are smart dogs. What Price are Cocker Pug Puppies? The price of Cocker Pug puppies is approximately $600 to $1,100. How to Find Reputable Cocker Pug Breeders? Generally, it’s not a good idea to buy a Cocker Pug puppy from a pet store, especially if the store does not say where the puppy came from. Too many puppies in pet stores come from puppy mills, where breeding mothers are forced to pump out litter after litter to meet a demand for puppies. A reputable breeder can be found through the national kennel clubs. They can refer you to the particular breed organization, another good resource for finding breeders close by. These breeders would be held accountable for the environment and care given to the dogs. A reputable breeder minimizes inbreeding. Inbred animals can often bring recessive and undesirable genes to the forefront. A reputable breeder will be upfront about the pedigrees of the parents. If they refuse to show the pedigrees, you should be concerned that they may not be breeding responsibly. A reputable breeder will have tested the puppies for hereditary diseases that are typical to the breed. Do go look at the puppy before you agree to buy! A reputable breeder will let you meet the puppy’s parents and allow you to tour the grounds. The Cocker Pug needs daily exercise. They have a tendency to become pudgy when under exercised. This dog thrives in a large house or an apartment. They need daily exercise and plenty of attention. Most are very smart but can be stubborn. A lot of these dogs are also motivated by food. The Cocker Pug is perfect for all sorts of owners. The Cocker Pug will be larger than the Pug and may weigh between 18 and 35 pounds. He will have a solid and muscular body. Most Cocker Pugs have coats that are either fawn or black. His Pug side may give him a flattened face and a short muzzle, but it will not be extreme like the Pug’s. Because his face will not be as flat as the Pug parent, the Cocker Pug will not have brachycephalic syndrome. He may have folds on his face and an overall squishy appearance. He will have a wavy or smooth coat that is long or medium length. 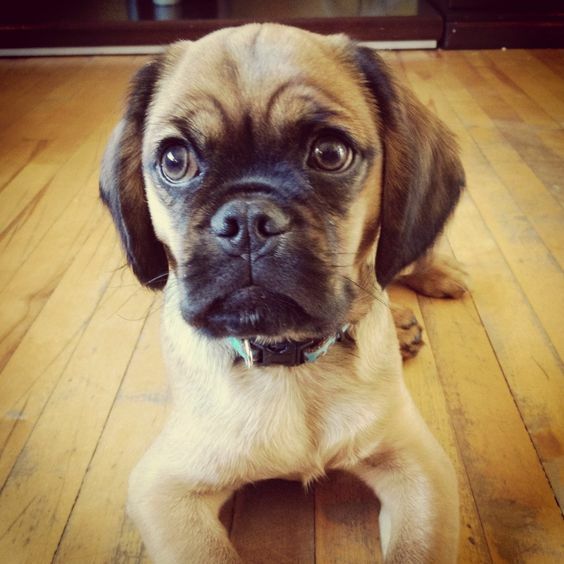 He will have dark color eyes, and their eyes will be larger than the Cocker Spaniel’s and not as bulgy as the Pug’s. They may also have legs that are longer that parent Pugs. Regardless of what the Cocker Pug looks like, he will be a sweet and adorable dog. He should be brushed several times a week and occasionally trimmed by a professional groomer. Nails should be trimmed monthly. If you do not feel comfortable trimming his nails, you can ask the groomer or your veterinarian to trim them. Their floppy ears will also need to be kept clean to prevent infections. The Cocker Pug may need to be given a bath every month, especially if likes rolling in the dirt whenever he’s outside. If he has folds on his face, make sure to keep them dry and clean to prevent fold dermatitis. Their teeth should also be brushed every week to avoid tartar buildup. To prevent boredom or to keep him content when alone, he should be provided with fun toys. How Big is a Full-Cocker Pug? A full grown Cocker Pug grows up to 12 to 18 inches and weighs 18 to 35 lbs. What is the Life Expectancy of the Cocker Pug? The life expectancy of the Cocker Pug is 10 to 13 years. The Cocker Pug can be mischievous and a bit clownish. The Cocker Spaniel is a social, happy, and affectionate breed. They are sweet and gentle dogs who love children. If they are socialized at an early age, they are usually good with other dogs. Cocker Spaniels are eager to please and crave their owner’s attention. They are energetic and love to play and explore. Pugs are not an aggressive breed. They are little clowns with high intelligence. They love to spend time with their owners and crave to be the center of attention. They can be a little lazy, which can cause them to gain weight. They have low energy levels and are happy just hanging out at home. They cannot be allowed to be a couch potato, though, that’s why daily exercise is necessary. They are strong and wonderful with kids and other dogs but can be a little stubborn. 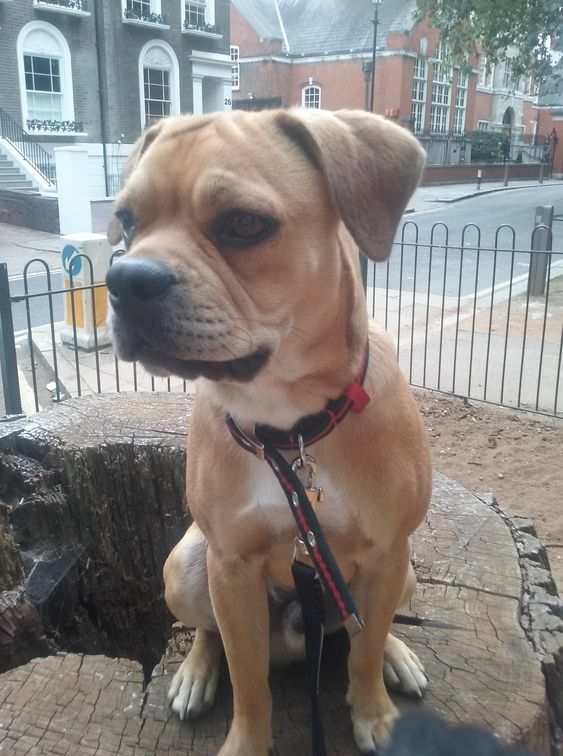 Your Cocker Pug will be a happy combination of his parents and will be charming, intelligent, and an awesome loving companion. However, he will also need a lot of attention, consistent training, and play interaction. If you are unable to provide these necessities, the busy Cocker Pug may not be for you. Protein is very important for your Cocker Pug’s diet. It’s recommended that they receive 22% protein for growth in puppies and 18% for maintenance in adult dogs. Most good quality dog foods will exceed these percentages. Fat is an important source of energy for dogs and should comprise at least 8% of the diet for Cocker Pug puppies and 5% of the diet for adults. Fat also adds flavor to dog food and makes it very appealing to your Cocker Pug. Fats are also one of the sources of omega-3 and omega-6 which are excellent for your dog’s brain, heart, coat, and skin. How Much Exercise Does a Cocker Pug Need? Pugs tend to have low levels of energy, while Cocker Spaniels are more energetic. Your Cocker Pug may have a low to moderate energy level and could need up to 45 minutes per day of stimulating playtime and walks. They are social dogs that enjoy going out and making new friends. Your hybrid can be laidback though, which can easily make him gain weight. Daily walks and exercise are required to prevent obesity. Because of their shorter muzzle, the Cocker Pug may be susceptible to heat. They should be walked when the heat is not intense, preferably early morning or at sunset. The Cocker Pug can live comfortably in an apartment or house. Playing and exploring in a fenced in yard will make him very happy. 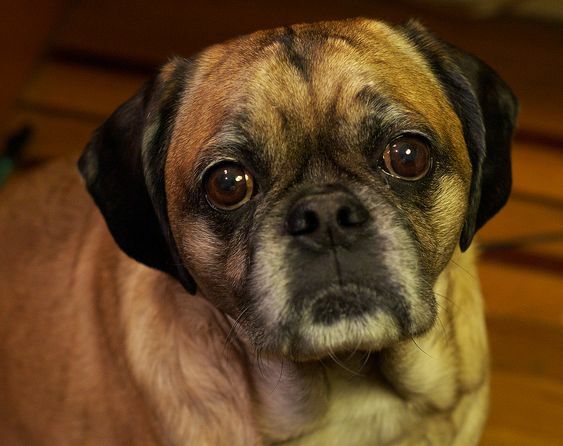 The Cocker Pug may or may not inherit the intentional genetic deformity that makes a Pug a pug, the brachycephalic head. Some will get the longer snout, thanks to the Cocker Spaniel genes. Those that get the Pug face, however, will have far more health problems than those that get the Spaniel-shaped head. Otherwise, there is not much that’s known about this hybrid dog’s health outline. The best thing is to understand the health of the two purebred parent breeds. It’s also recommended to meet the puppy’s parents and make sure that all the health tests have been properly done, and to see the rest of the litter as well. This dog is prone to eye diseases, respiratory complications, hip dysplasia, pure dog encephalitis, and patellar luxation. Cocker Pugs are all lovely and friendly. They need human attention and are also very much food motivated. They are suited for those who love their dogs, like Pug owners! A Cocker Pug makes a great companion dog, perfect for all sorts of owners. They get on great with other dogs. They are feisty, and their attempts at being aggressive are cute. They strive to please their owners, but they must be managed, or they will continue to do as they please. Overall, they can be mischievous, a bit clownish, and more than charming. Cocker Pugs are smart dogs, but they seem to only show it if they think that the result is a snack. Knowing this, you should be able to help them use their considerable intelligence to quickly learn a lot of neat tricks as well as be obedient when commanded to do so. They are a bit pushy when not outright demanding, and what they usually want above all else is food. They also love to jump up on things, especially people and furniture. This should be controlled early on yet gently so. Failing to teach them to not jump on things and people without permission will tell them that it’s okay to. These dogs tend to get a fair amount of exercise walking around, looking for food, and just being generally nosy. They still need a brief outdoor walk every day, however. This allows them to get some real exercise as well as to help socialize and train them.